This week at Sassy Cheryl's, the challenge is about "School Days". The greatest part of school is graduating...don't you think? When my boys graduated from school, I got both of them the Dr. Seuss book "Oh the Places you'll go" (this book is so appropriate for anyone starting a new venture in life). I found this sentiment in the Silhouette Store and thought it would go perfect with my graduating Sally. Still learning how to use Spectrum Noir markers...little bit of a learning curve from Copics...but a lot more affordable...we'll see how it goes. Ok..no laughing about the tassel...the ribbon is so tiny, I couldn't get the loops to all go in the same direction...so ...poopitz!! I have also entered this card into the Sketch challenge #192 at Operation Write Home. You are so darned creative and talented!! The perfect embossed background, the cutest little graduate and that tassel is just perfect and the card would not be complete without it!! She is very cute! I love the layout of your card. I agree. .. .graduating is definitely the best! Always gorgeous coloring and oh so stunning. Thanks for playing along in the challenge this week! Now, this is just too darn cute! Love the white on white and the marvelous tassel! Thank you for joining us this week for Sassy Cheryl's Back to School challenge! Poopitz Smmothchitz. I love the tassel. Looks more natural that way. Great card. good luck on the Spectrum Noirs. Thanks for joining the Back to School Challenge at Sassy Cheryl's. It is always fun to see your creations. I love it! The sweet colors and elements are totally fab!! The background is what really stands out to me! WTG!!! Oh how cute! Love this card, Penny! So adorable! 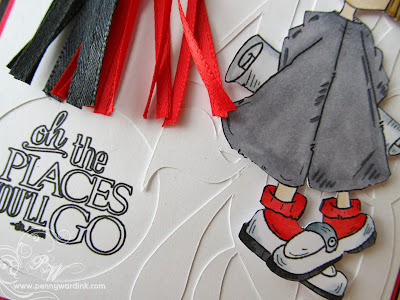 I love the numbers background and your fun tassel!